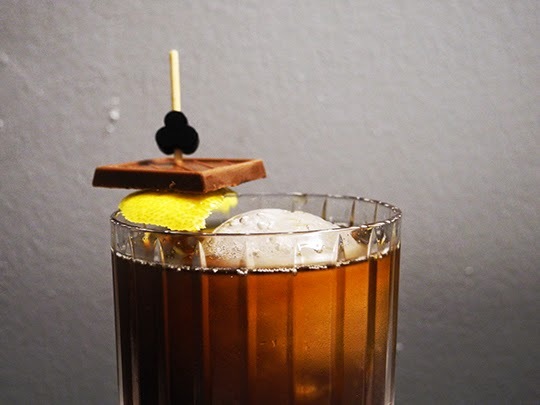 This cocktail was inspired by the Tabasco Smoke Chipotle Dark Chocolate Ice Cream created by Denise Woodward from Chez Us. Denise was on the Tabasco Tastemakers trip with me in March. She was an absolute delight to get to know, as were so many of the other bloggers. But her Chipotle Chocolate ice cream had my mouth watering and got me thinking about a smoky chocolate cocktail. On a recent trip up to Tuthilltown Distillery, I tasted their new Cacao Liqueur, which was exactly the base spirit I needed to make this cocktail work. 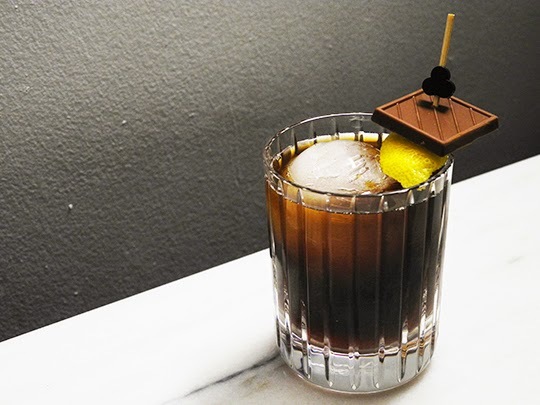 This liqueur tastes like a gorgeous piece of dark chocolate - not too sweet, but just sweet enough to satisfy your cravings. I also wanted to add a darker baritone note, so I've used Black Walnut Bourbon Liqueur from Dancing Pines Distillery in Colorado. 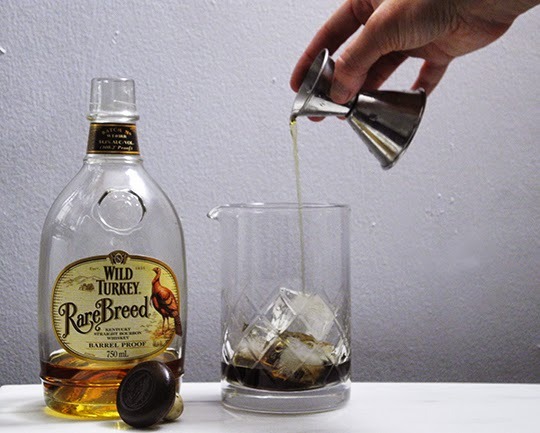 And finally, to cut the sweetness and give it a little bit more oomph, I've added Wild Turkey Rare Breed Barrel Proof Bourbon, a powerful yet creamy bourbon that has chocolate and caramel flavors with a bit of tobacco and a touch of spice. 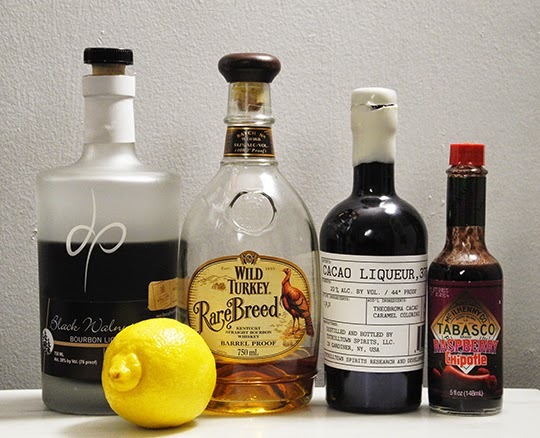 Normally, I reserve the Rare Breed for sipping, but I couldn't resist adding one of my favorite bourbons to this cocktail. I've also added about 1/8 oz of Tabasco Raspberry Chipotle Hot Sauce, an expressed lemon peel, and topped off with a square of milk chocolate (because, yolo). I love this cocktail. 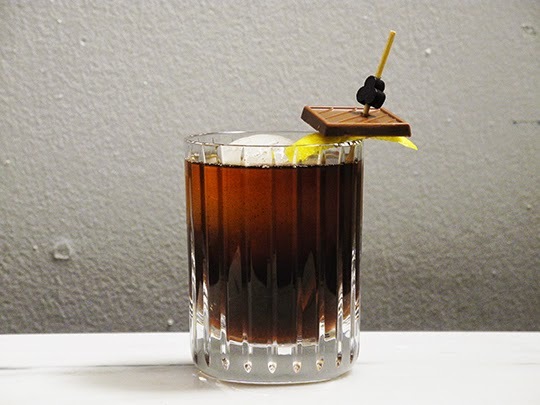 It's a serious (ok, not too serious) version of a chocolate cocktail: dark and brooding, with a just a touch of raspberry smoky sweetness from the hot sauce and bright aromatics from the citrus oil. Finishing with the milk chocolate square is a delicious (and a bit gluttonous) finale. 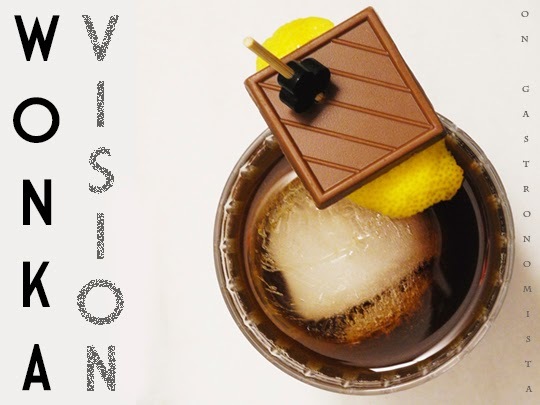 All I wish is that I could send little mini versions of this cocktail to you through the Television Chocolate Machine! 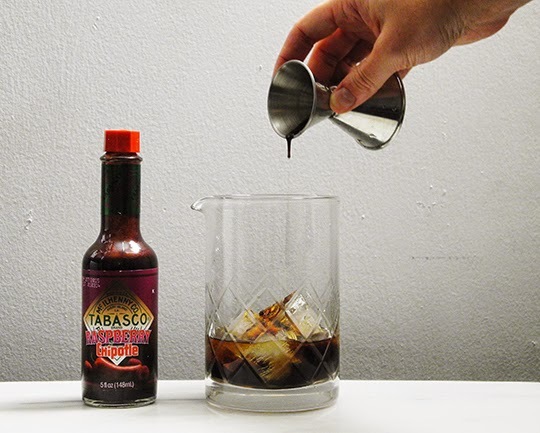 Stir with ice and strain into an old fashioned glass with an ice ball. 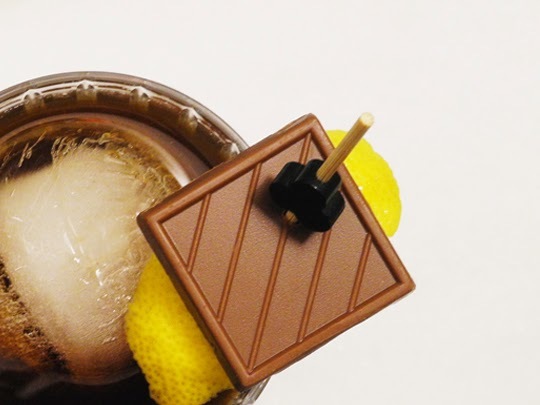 Express a Lemon Peel on top of the cocktail, and garnish with a lemon peel and a square of milk chocolate.